Sophie says..: Inside my make-up bag! (1) I personally believe that if you're going to spend the money on buying quality makeup, what you carry it in is equally important. 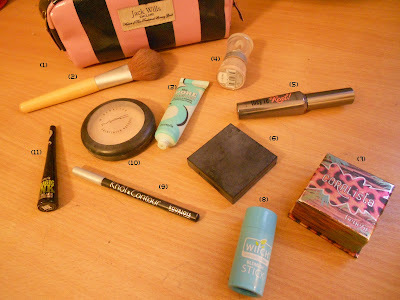 That's why I swapped my tiny Clinique freebie makeup bag for the gorgeous Romiley Make Up Bag (Jack Wills,£19). It's spacious and is made of oil cloth, making it easy to wipe clean and protect your make up brushes etc. from gathering bacteria. (2) For anyone who doesn't know, I consider the carbon footprint of everything I buy and care deeply for the environment. That's why when I had to buy the Ecotools Bamboo Powder Brush (Boots, £9.99). It uses the highly-sustainable bamboo plant for the handle, and recycled aliminium for the ferrule. The synthetic taklon bristles are cruelty free (As opposed to other brands' make-up brushes that use real animal hair?! ), and they're super soft so my loose powder glides on evenly. (3) As i've said before I suffer from oily skin, and it isn't uncommon for makeup to just slip off my face, which prompted me to purchase The Porefessional (Benefit, £23.50). It's a balm that you use to minimise the appearance of pores and leaves your skin smooth and even, ready for makeup application. In personal experience it extends the coverage time of my makeup and the oiliness is gone. (4) I have a lot of different liquid concealers, but for during the day I really just prefer to wear powder so my skin doesn't feel to heavily covered, which is why Correcteur Mineral (Loreal Paris) goes with me everywhere. I've had it so long I can't remember how much it was, but it was bought in Superdrug at a time when I had hardly any money so I doubt it was more than a few pounds! When using this product, a little goes a long way so it's lasted me ages! It definitely does the job of covering my blemishes and spots, without feeling like it's blocking them like liquids can do. (5) This is the mother of all mascaras. I cannot get enough of this, and cannot praise it enough. I purchased They're Real! (Benefit, £17.50) about 4 months ago, and I cannot believe that I haven't run out yet as I wear it practically every day. It elongates my lashes like no other mascara has ever done, and the spiked ball at the end of the wall is useful for pulling up individual lashes that you have missed while applying. It really opens my eyes and makes them stand out - Now i'm just waiting for Benefit to bring out different colours so I can buy them all! (6) Well kept eyebrows have always been a top priority for me. Which is why it's important for me to have a handy eyebrow kit to carry around with me so they're constantly looking their best. Brow Zings (Benefit, £22.50) comes with everything you need for perfect eyebrows: Pigmented wax for shaping, natural shaded powder for darkening, a tiny pair of Tweezerman tweezers, a mirror and both a hard-angle and blending brush. It also comes complete with a lesson of how to use everything, and achieve perfect eyebrows in minutes. This will never leave my makeup bag. Ever. (7) Blusher is the thing that changes most in my makeup bag. Currently, I have Coralista (Benefit, £23.50), a coral blush that I love wearing when I want people to notice that i'm wearing makeup. It's suttle, but has a slight glow which warms up a pale face like mine! When I want something more natural I switch to Benefit's Dandelion, which is a pale pink. It comes with a compact brush inside, and the newer shades from Benefit also have a mirror on the inside too! (8) I've reviewed this product before so I won't go into it, but Witch Stick is perfect for calming down the redness of a spot instantly, so it's always handy to have. (9) I have a never-ending collection of eyeliners, ranging from a 99p pencil from Savers to a £17 kohl crayon from Dior, but this is the eyeliner that can't be beaten in my eyes. Khol & Contour (Bourjois Paris), glides on easily and leaves a jet black line for hours. It goes on thick and easily, so I don't have to spend ages colouring in my eyelids! (10) I cannot stress how important it is to invest in a decent foundation. Cheaper brands may be better for your bank balance, but they aren't always the best for your skin. 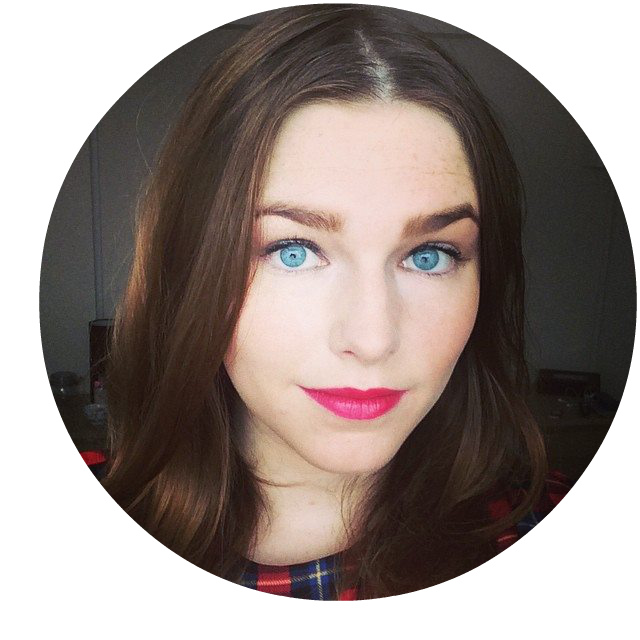 I use Mineralize Skinfinish Natural (Mac, £18.50) for matte, low coverage that lasts all day. It's light and allows my skin to breath while it covers the redness on my face and leaves my skin feeling refreshed and so smooth it feels as though i've just moisturized. (11) Liquid eye-liner is only something i've been using in the past few months. I always thought that because I had such small eyes it wouldn't really compliment them by piling on jet-black around my eyes. However, what's amazing about Magic Ink (Benefit, £13) is that the brush is so thin that you don't have to over-do it if you have smaller eyes and eyelids like me. It look me a while to get used to drawing a straight line, but the sleek brush makes it quick easy to line your eyes in one stroke. I'm so glad I tried this product; I can't imagine going without it now! I'm constantly on the lookout for amazing products, but these are my makeup staples. What are your beauty essentials?